These pigs have a date with the butcher in just two weeks. And they outgrew the shade from pallets: too long to fit under one, so big they break up multiple pallets strung together. Direct sun is tough on anyone. It wears a body out faster, makes one lose appetite and dramatically increases efforts at keeping cool. We want efforts to be directed towards adding weight, not struggling to keep cool. In years past we have been out on boats in brutal sun, and constructed makeshift shade. 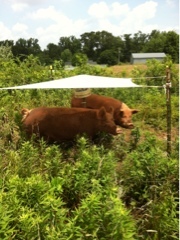 The pigs got a little homemade shade so that they can just relax in the heat of the day. A tarp and few bungees, a tee post or two. All the difference.